You are currently browsing the tag archive for the ‘Molly O’Brien’ tag. 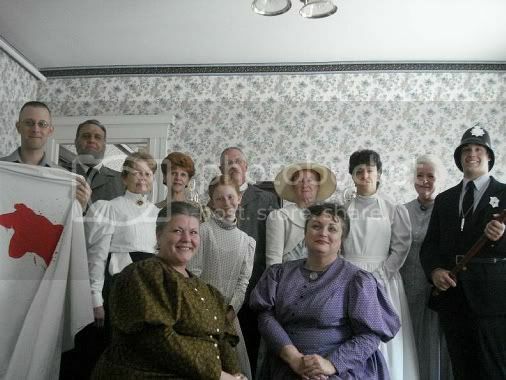 As the date for the annual re-enactment at the Lizzie Borden Bed and Breakfast approaches, a few new members will be joining the cast for 2010. Over the next couple of weeks, more about this year’s cast, costuming and script will appear. Stop by and visit often! Presenting Miss Manning- Molly O’Brien! Good things do come in small packages. The petite Molly O’Brien joins our cast this year in the “imagined” role of Miss Manning, reporter from the Fall River Herald. Molly has some serious acting chops and costuming credits for a young ingénue! Arriving at the Lizzie Borden Bed and Breakfast in October of 2009, she has become a welcome addition to the staff of daytime tour guides with her bubbling enthusiasm for the case, and cheerful presence. Molly’s character will be a take-off on the real Mr. Manning, who, after a timely call from passerby John Cunningham, arrived at the Borden house soon after the discovery of Andrew Borden’s body on August 4, 1892. 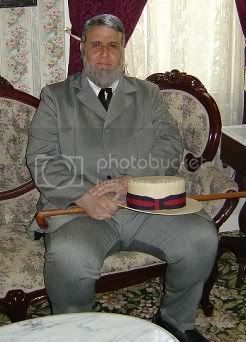 “Miss Manning” will be interviewing Lizzie’s Uncle John Morse, hoping for a “scoop”. “Lizzie did it. She was in the right place, had the time, and most of all- she had the best motive. But I think Bridget saw and knew something about it all,” said Molly on the topic of whodunnit. If Molly could be one person on the fateful day, it would be Alice Russell, who was in a position to observe everything as she stayed at the Borden house after the maid quit on Friday. The weapon, she feels, was the hatchet later found on the top of Crowe’s barn and was the weapon for both homicides. On the topic of whether or not Lizzie Borden deserves any sympathy for her life after the acquittal Molly believes, “If you are convinced she did it, she deserves none- nobody should have to die the way the Bordens did.” Molly was inducted this past April into the Noble Order of Mutton Eaters and is a member of the Second Street Irregulars. Uncle John will not be able to resist the charms of Miss Manning!